Always Crafting: Do you see spots? 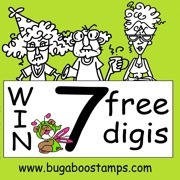 Bugaboo Stamps is giving away a prize of seven digital images of the winner's choice! The Ribbon Girl is giving away a prize of 5 voucher! Hello Dawn! This is very cute!!! love the layout and the fun papers. He's so cute! So cute! Love the layout! Thank you for celebrating our 2nd Birthday with us by sharing your creation in our “Happy Birthday” challenge at Catch The Bug! We hope you’ll join us in our mini challenges, this week, too! 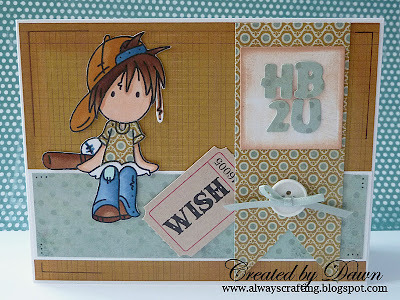 ~~Sammibug,~~ Guest Designer For Bugaboo Stamps. Beautiful card love the colours and your gorgeous design, it looks terrific. Thank you for celebrating our 2nd Birthday with us over at Catch the Bug. Adorable! Love the little ticket embellish! Such a sweet card all around! Thanks for joining us at Catch the Bug for our Birthday Bash! Super cute -- love how you did the sentiment and the ticket! Thanks for joining us for our birthday celebration @ Bugaboo!